This topic contains a high level and non-exhaustive list of new features added to QGroundControl in version 3.2. For more information see Settings > General (Miscellaneous). 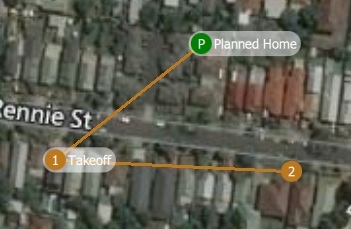 If this setting is turned on, QGroundControl will automatically upload a plan to the vehicle when it connects. The plan file must be named AutoLoad#.plan where the # is replaced with the vehicle id. The plan file must be located in the Application Load/Save Path. You can now specify a save path which QGC will use as the default location to save files such as Parameters, Telemetry or Mission Plans. 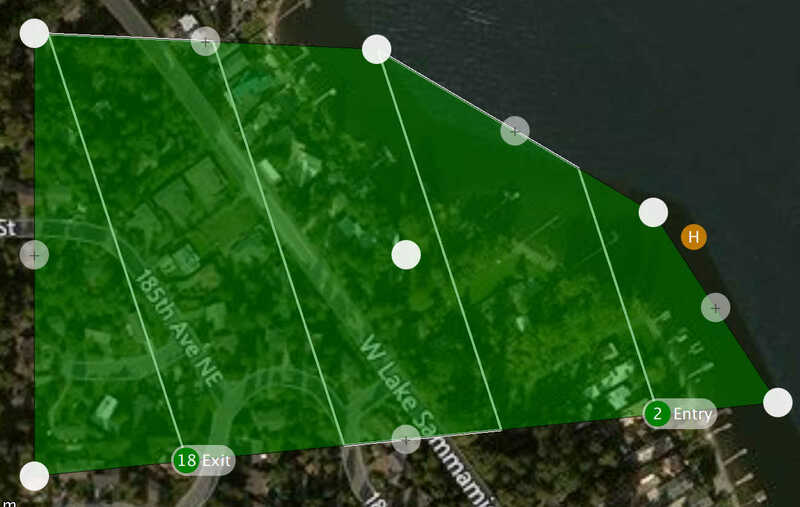 You can now specify the Survey in accuracy and Minimum observation duration for use with a connected RTK GPS. This is now supported from the Sensors page. This is now supported from the Copy Trims button on the Radio setup page. 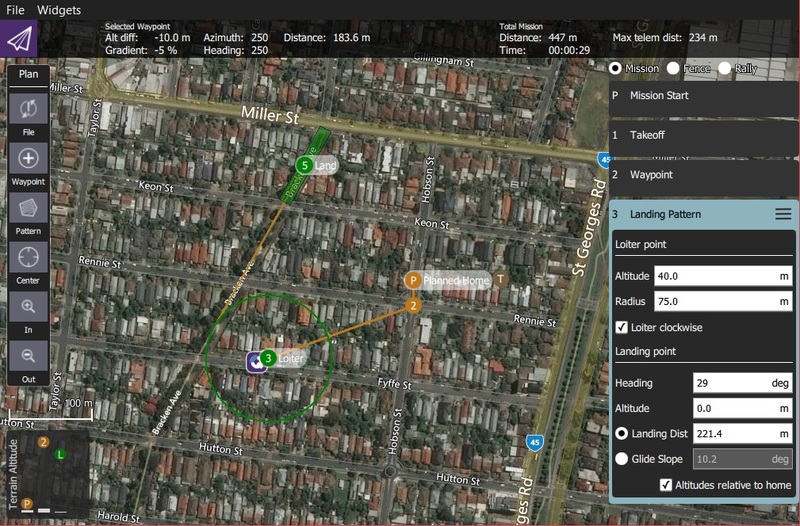 Previous version of QGroundControl saved missions, geo-fences and rally points in separate files (.mission, .fence, .rally). QGC now save all information related to a flight plan into a single file called a Plan File with a file extension of .plan. Information about the format can be found in Plan File Format (QGC Developer Guide). The new Plan Toolbar is displayed at the top of the PlanView. 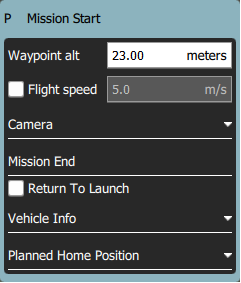 It shows you information related to the currently selected waypoint as well as statistics for the entire mission. When connected to a vehicle it also shows an Upload button, which can be used to upload the plan to the vehicle. The Mission Settings panel allows you to specify values which apply to the entire mission, or settings you want to control right at the beginning of a mission. This is the first item in the mission list on the right of the screen. This specifies the default altitude for newly added mission items. If you update this value while you have a mission loaded it will prompt you to update all the the waypoints to this new altitude. Check this if you want your vehicle to RTL after the final mission item. The camera section allows you to specify a camera action to take, control the gimbal and set your camera into photo or video mode. When planning a mission the firmware being run on the vehicle as well as the vehicle type must be known in order for QGroundControl to show you the mission commands which are appropriate for your vehicle. If you are planning a mission while you are connected to your vehicle the Firmware and Vehicle Type will be determined from the vehicle. If you are planning a mission while not connected to a vehicle you will need to specify this information yourself. The additional value that can be specified when planning a mission is the vehicle flight speed. By specifying this value, total mission or survey times can be approximated even when not connected to a vehicle. The planned home position allows you to simulate the vehicle&apos;s home position while planning a mission. This way you see the waypoint trajectory for your vehicle from takeoff to mission completion. Keep in mind that this is only the "planned" home position and you should place it where you plan to start the vehicle from. It has no actual impact on flying the mission. The actual home position of a vehicle is set by the vehicle itself when arming. 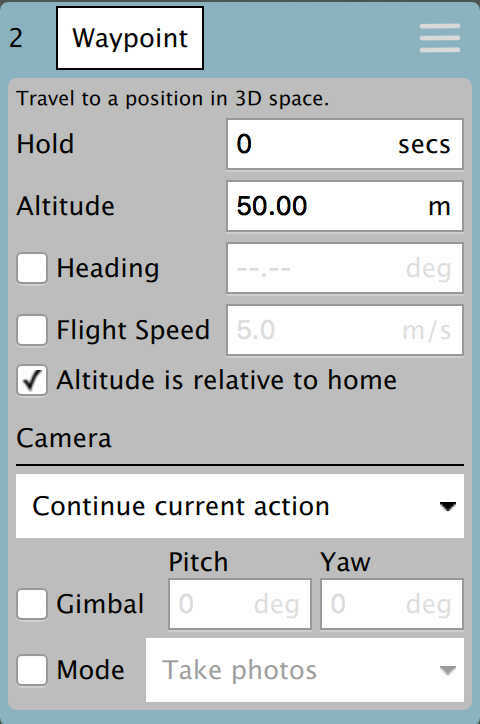 You can now adjust heading and flight speed for each waypoint. There is a camera section available for camera changes on each waypoint. 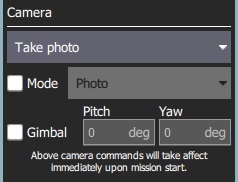 Explanation of Camera Section can be read under Mission Settings above. 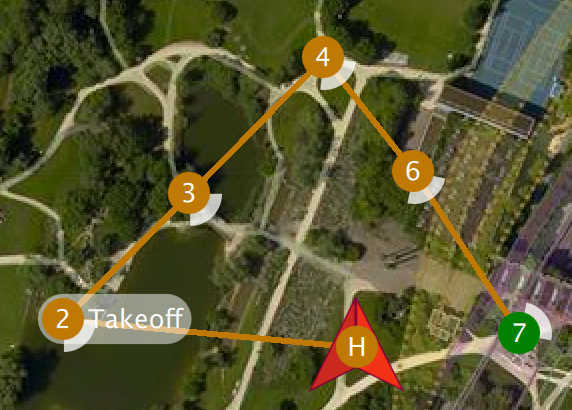 If you specify gimbal yaw changes on waypoints, both the plan and fly views will show you a visual representation of the gimbal direction. This adds a landing pattern for fixed wings to your mission. The first point of the pattern is the loiter point which commands to vehicle to loiter to a specific altitude. Once that altitude is reached, the vehicle will begin the landing sequence and fly down to the specified landing spot. Both the loiter and land points can be dragged to adjust. Also all the various values associated with the pattern can be adjusted. For more information see Fixed Wing Landing Pattern. Images are not automatically taken in the turnaround zone outside of the polygonal survey area. You can drag the entire polygon to a new location by dragging the center point handle. Each polygon vertex can be dragged to a new location. To remove a polygon vertex, simple click on the drag handle for it. Click on the + handles to add a new vertex between two existing vertices. RTK status is now shown in the toolbar. There is an armed/disarmed indicator in the toolbar. You can click it to arm/disarm your vehicle. If you click Disarm in the toolbar while your vehicle is flying you will provided the option to Emergency Stop your vehicle. The Resume Mission guided action is used to resume a mission after performing an RTL from within the mission to perform a battery change. After the vehicle lands from RTL and you have disconnected the battery do not disconnect QGC from the Vehicle. Put in your new battery and QGC will detect the vehicle again and automatically restore the connection. Once this happens you will be prompted with a Resume Mission confirmation slider. If you want to resume the mission, confirm this and the mission will be rebuilt from your last waypoint traveled through. Once the mission is rebuilt you will be presented with another Resume Mission slide which allows you to review the rebuilt mission before starting it again. Confirm this Resume Mission slider to continue on with the mission. Flight time is now available for display in the instrument panel. 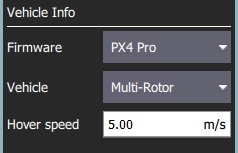 For new users, flight time will be shown by default. 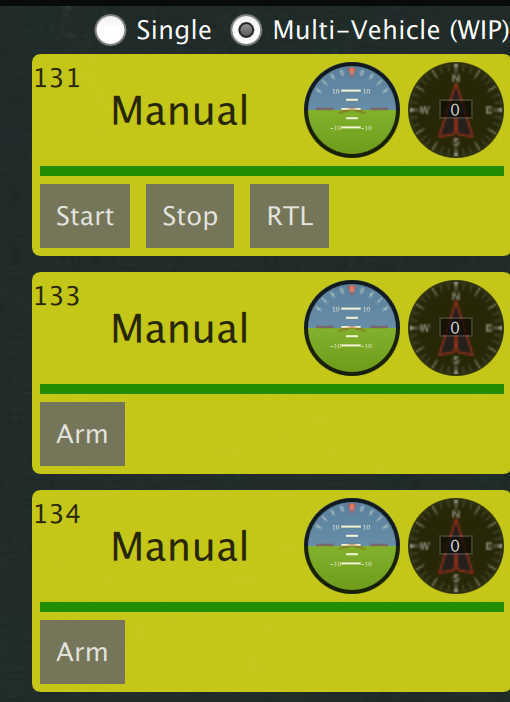 For existing users who have already modified their instrument panel values you will have to add it yourself if you want to use it. Log Download moved to Analyze View from menu.